Cities are powerful vehicles of change. They offer a concentration of activities, skills and ideas that can circulate, ricochet and recombine to create the preconditions for innovation. The complex, integrated networks and diverse subcultures in cities are conducive to dismantling tired approaches to problems in favor of new or reimagined approaches. Cities offer a concentration of assets that can contribute to expanded opportunity. The civic commons of waterfronts, parks, libraries and public spaces. Educational, cultural, entertainment, research and healthcare anchors. Physical and social infrastructures that foster the density, closeness and sense of history that’s characteristic of the nation’s great places. Cities are manageable units of governance, amenable to philanthropic engagement. Municipal problem-solving is being driven less by centralized governance from City Hall and more by widely distributed leadership comprising the philanthropic, private, civic and public sectors. Having a wide range of players encourages systematic thinking, with each partner contributing knowledge, talent, financial resources or influence. 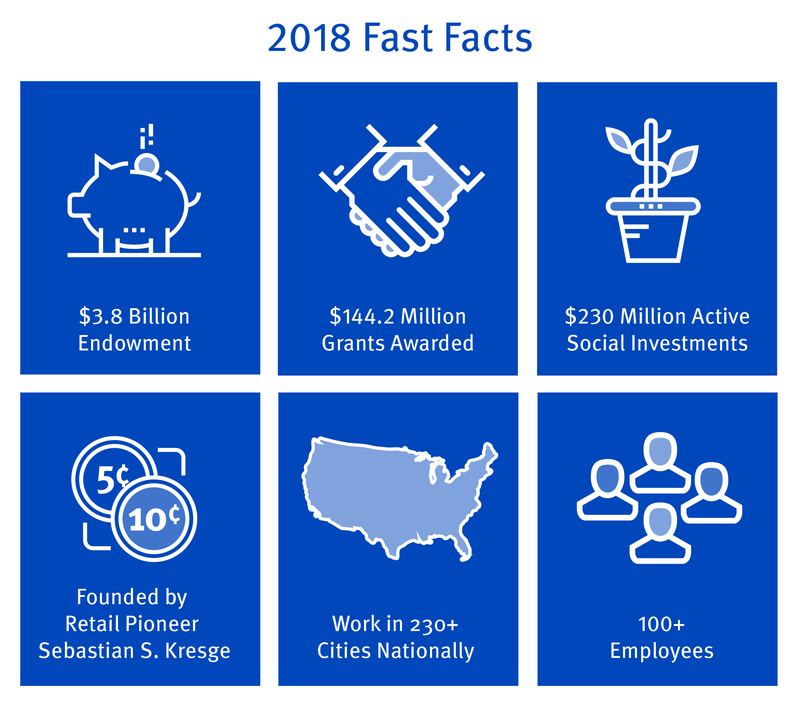 The Kresge Foundation is a private, national foundation that works to expand opportunities in America's cities through grantmaking and social investing in arts and culture, education, environment, health, human services and community development in Detroit. In collaboration with our nonprofit, public, private and philanthropic partners, we help create pathways for people with low income to improve their life circumstances and join the economic mainstream. Established by Sebastian S. Kresge in 1924: To promote human progress. These five values shape who we are as an organization and guide how we work – with each other and with our many grantees and partners. We will treat with respect every staff member, and everyone with whom we work, valuing each person’s distinctive background, personal style, and perspectives, while displaying honesty, dignity, kindness, trust, and collegiality in all of our interactions with one another. We will embrace experimentation, reasoned risk-taking, and continuous improvement, recognizing that we must balance support for proven and effective approaches with the pursuit of new approaches that, although unproven, hold the promise of breaking through stale or unproductive approaches to the seemingly intractable challenges our society faces. We will actively seek out and embrace opportunities to partner and support others to devise and implement solutions, recognizing that by cooperating, coordinating, and aligning with others and one another we will leverage collective experience, insight, networks, and resources to more effectively advance the foundation’s mission to promote human progress. Through the work of our programs and partnerships, we will deploy an array of grantmaking and investing tools to expand opportunities for low-income people living in America’s cities so that they may improve their life circumstance and join the economic mainstream. We will foster a workplace environment and culture in which staff members have the opportunity to express their talents and ambitions, be acknowledged and rewarded for their achievements, grow in their effectiveness and careers, and see their efforts reflected in a strengthened sense of common purpose. In 1924, with an initial gift of $1.6 million, Sebastian Spering Kresge established The Kresge Foundation in Detroit. He did this to commemorate the 25th anniversary of the S.S. Kresge Company, which began as a single five-and-10-cent store – a revolutionary merchandising idea at the time – and grew into a nationwide chain of stores. Many years later, the enterprise became known as Kmart Corp.
Mr. Kresge chaired the first foundation board meeting and then served as treasurer until his death in 1966, at age 99. By then, he had contributed $60.5 million to the foundation. All along, he maintained a steadfast commitment to charitable giving. For more than 80 years, his mandate to promote human progress was realized through the support of fundraising campaigns to build capital projects – libraries, hospitals, schools, museums, community centers and the like – that, over the years, have contributed to the creation of the nation’s nonprofit infrastructure. The Kresge challenge grant created community excitement, spurred the growth of a nonprofit’s donor base, and helped the organization reach its fundraising goal. In 2006, we embarked on a multiyear transition to redefine ourselves for the needs of the 21st century. What resulted – and is in full operation now – is a strategic philanthropy. We view issues in their entirety, take measured risk, and employ an array of grantmaking and social investing tools to help expand opportunities for low-income people living in cities. Our programs and their specific strategic objectives emanate from the disciplines in which we have traditionally worked: arts and culture, education, environment, health, human services, and community development in Detroit. Since our founding, improving the life circumstances for low-income, underserved adults and children has been our constant philanthropic focus. In 2012 we narrowed our geographic focus to the nation’s cities. More than 80 percent of the U.S. population lives in and around cities. Working in them offers us the greatest potential to assist the largest groups of people experiencing hardship and poverty. Mr. Kresge established The Kresge Foundation in 1924 and since then the Kresge family has provided guidance and inspiration for the private philanthropy. Following Mr. Kresge's tenure on the board of trustees, which ended with his death in 1966, his son Stanley S. Kresge assumed the chairmanship of the board. Since then, descendants have had continuous representation on the board, including grandson Bruce A. Kresge and great granddaughters Deborah McDowell, Katherine Lutey and Susan Drewes. Cynthia Kresge, another great granddaughter, is currently serving as a trustee.